In the second half of last season, the Reds played just about .500 baseball, and they were driven in large part by a new version of Joey Votto — a version of Joey Votto that refused to strike out. However, while Votto drew himself a little bit of attention, it never became a major story, mostly because of the Reds’ miserable first half knocking them off of everyone’s radar. By the time August rolls around, there are teams that are already out of the hunt, and those teams don’t get very much coverage. It’s still the first half of this season, and the Reds have played just about .500 baseball. They’ve been driven in large part by a sustained version of Joey Votto — a version that still refuses to strike out. Don’t get me wrong, Votto was never particularly whiff-prone. It’s not like this is Chris Davis learning to put everything in play. But Votto’s a guy who’s entered his mid-30s. Contact is thought of as a young-player skill. In this way, Votto’s turned back the clock, and also bucked the league-wide strikeout trend that so many others have fallen into. I like to work a lot with plots of rolling averages. I think they do a good job of showing where players have been in their own pasts, and they help with comparisons when you’re still in the early stages of a developing regular season. 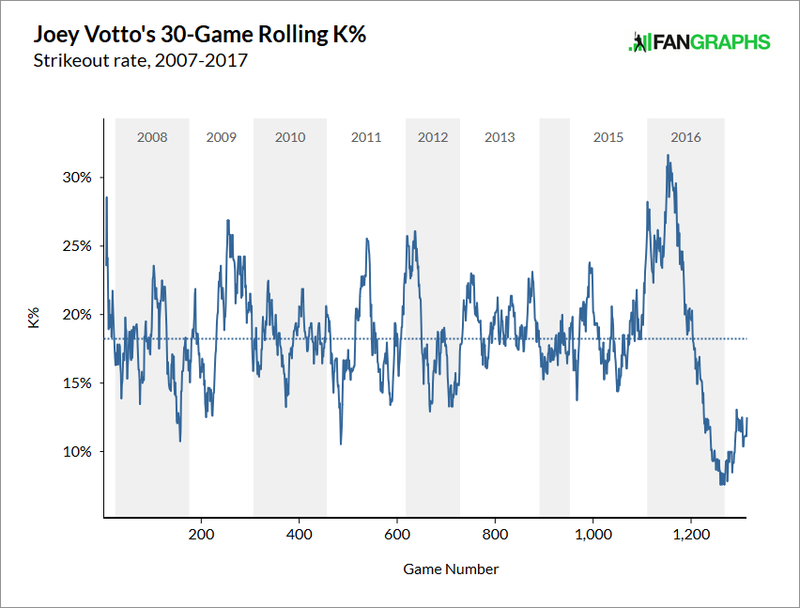 This is a rolling-average plot of Votto’s strikeout rates. I don’t think I need to point out the 2016 All-Star break. The dip you can see is astonishing. 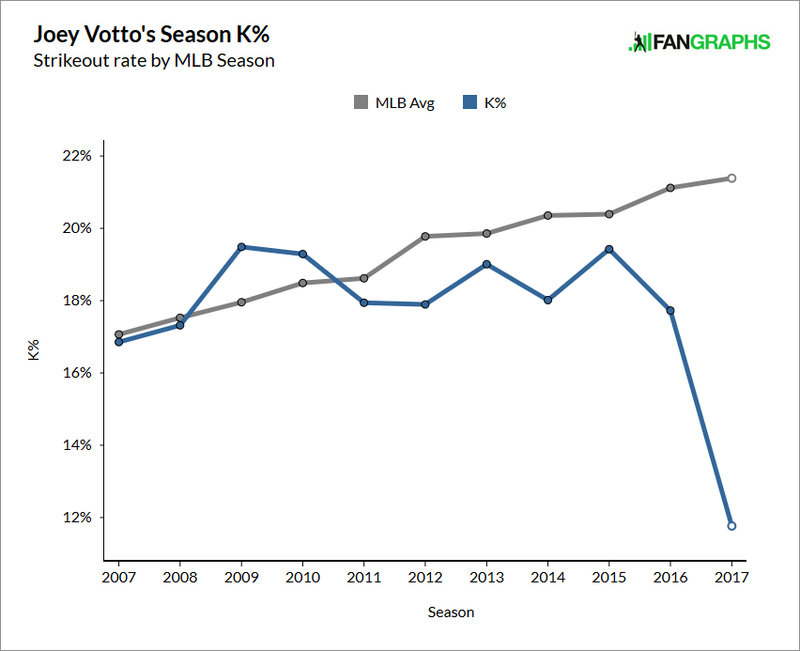 As strikeout rates continue to climb, Votto seems to have focused on strikeout avoidance. While last year’s second half is a somewhat small sample, and while 2017 to date is another somewhat small sample, it’s not a small sample when you put them together. Votto has carried over his achievement, and what’s more is that he’s still drawing a ton of walks. Frequently, strikeouts and walks go hand in hand, because they both generally require deep counts. Votto right now has baseball’s 13th-lowest strikeout rate, among qualified hitters. He has baseball’s third-highest walk rate. Joey Votto’s plate approach appears to be…I don’t know, perfect? Close to perfect, at least relative to ordinary human standards. How can a player do what Votto has done? As a hint, I’m going to return to a plot I posted a little while back, when I wrote about the Twins. 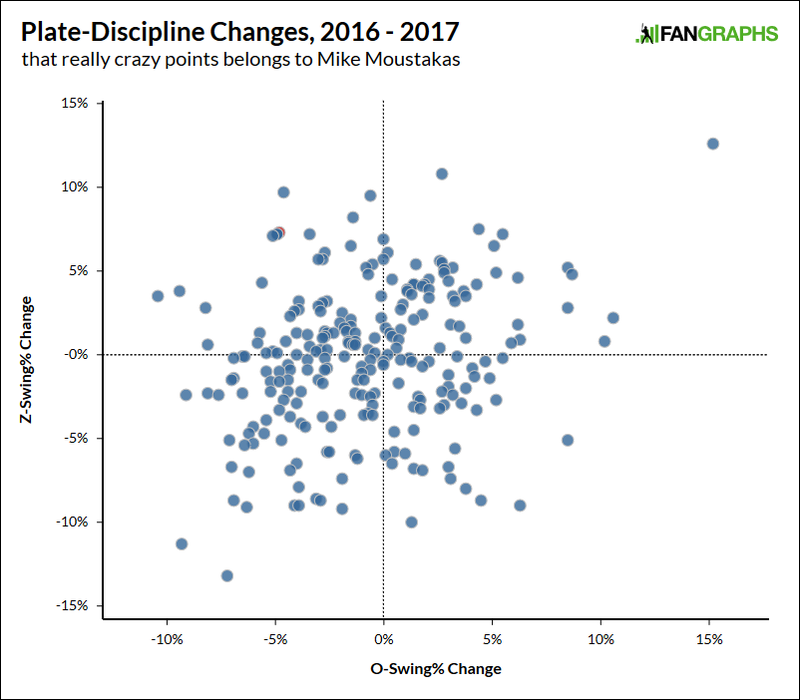 This just straight-up compares 2016 and 2017, in terms of changes in chase rate and changes in swing rate at would-be strikes. I know it might be better to split out Votto’s 2016 second half, but it’s not really necessary. Votto’s made a change since then, anyway. Votto’s point is red, and kind of hidden. 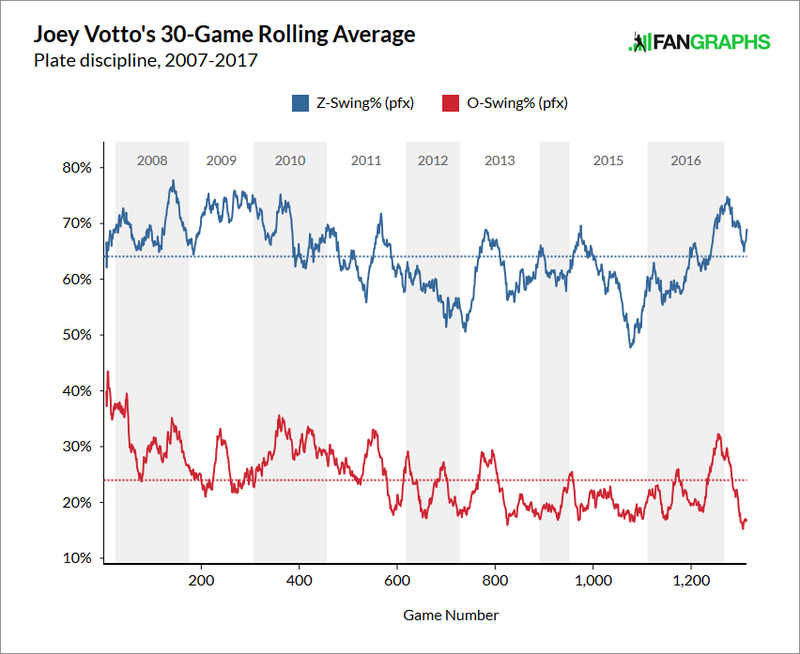 His isn’t the most extreme data point in there, but it is among them, as Votto has trimmed his chase rate by five percentage points while increasing his in-zone swing rate by seven percentage points. That’s not an easy thing to pull off, and — I’ve mentioned before that I like to subtract O-Swing% from Z-Swing%. Votto, this year, has a difference of 52 points. Last year, he had a difference of 40 points, good for a present increase of 12.1 points. The greatest year-to-year increase for any qualified hitter during the PITCHf/x era has been 10.5 points. 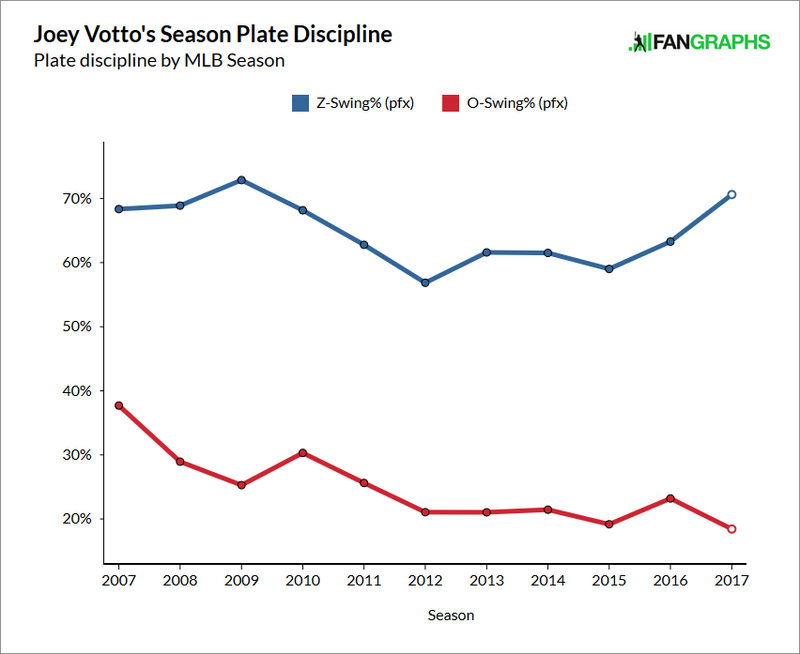 There’s a long way to go for Votto’s plate-discipline measures to settle, but so far, he’s done what any hitting coach would like. He’s been very aggressive against strikes, while hardly ever swinging at any balls. And, hell, why not look at where Votto has swung? 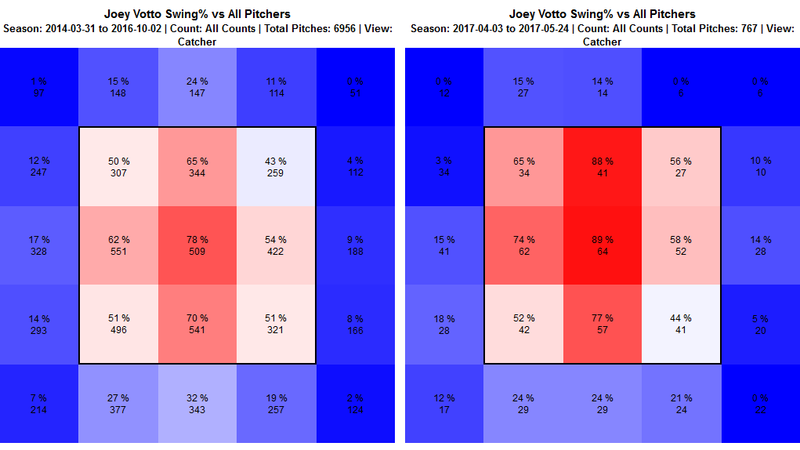 On the left, Votto’s swing rates from between 2014 and 2016. On the right, Votto’s swing rates for this year. This is from the catcher’s perspective, so Votto would be standing on the right side of the images. More swings at pitches over the middle, and more swings at pitches somewhat elevated. No meaningful swing increase low and out of the zone. Fewer swings up and out of the zone. Votto is somehow making it look easy, despite the fact that all pitches arrive at the plate in under half a second. And, of course, despite the fact that every individual pitch is supposed to be unpredictable. Something is happening, some kind of deliberate process, and it makes you wonder why it’s only happening around now. As another way of understanding how Votto has changed himself, last year, when he was already one form of great, he had twice as many balls hit fair as he had swinging strikes. This year, he’s up to three times as many balls hit fair as swinging strikes, which is one of the higher ratios in the game. It makes enough sense; a player with better discipline is likely to make more contact. Whiffs tend to come against balls. Votto isn’t chasing those. His strikeout rate is a career low; his contact rate is a career high. Everything falls into place because Votto is selecting many of the right pitches. In the earliest parts of this very season, articles were written about how Votto looked hyper-aggressive. Indeed, he was hyper-aggressive, swinging more often at everything. But that didn’t last, and Votto has abandoned part of that aggressiveness. He’s still going after strikes more than ever, but he’s basically stopped chasing, as one would expect. The only thing left here is trying to understand Votto’s 157 wRC+. That is a very, very good wRC+, but it’s also the same as his career wRC+, and it’s the same as his 2016 wRC+. It feels like Votto should be better. Instead, he’s kind of different and the same. According to Baseball Savant, Votto has his lowest average exit velocity since 2015. So there are two possibilities. One, Votto’s controlled-but-aggressive approach is costing him a bit of contact quality. Or, two, he just can’t hit with the same contact quality, so he’s offsetting that by striking out less. I don’t know, and I’m not sure where Votto’s numbers will end up. He’s still hitting home runs, he’s still not popping out, and he has what would be a career-low BABIP. Votto, at least, is still very good. And it’s possible a new chapter is yet to come. Somewhere in the middle of last season, Votto decided to stop striking out so much. Now he’s decided to swing at more strikes while keeping from swinging at balls. It’s possible that Joey Votto has the very best eye in the game today. He’s making different use of it than he has in the past, as he tries to remain a star long enough for it to matter to the Reds. We hoped you liked reading Joey Votto Has Just Simply Stopped Striking Out by Jeff Sullivan! Were those charts done on an oscilloscope?